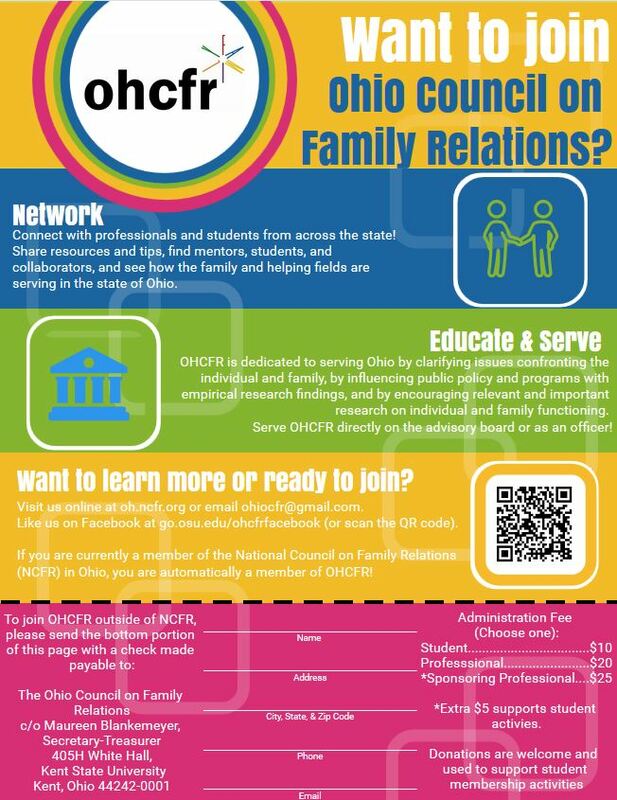 Ohio Council on Family Relations (OHCFR) is an Affiliate Council of the National Council on Family Relations (NCFR). The Affiliate Council’s purpose and function is to provide a forum and mechanism whereby elected representatives of local, state and regional Councils on Family Relations may exchange ideas and experiences and seek concrete methods to strengthen marriage and family relationships through their affiliation with the National Council on Family Relations. In accordance with NCFR’s mission, The Ohio Council on Family Relations (OHCFR) is an organization for practitioners, academicians, and students serving Ohio’s youth, individuals, couples, and families over the lifespan through research, education, and practice. Join Us! Click on OHCFR Brochure for membership information.